Russian President Vladimir Putin has said the Russian Su-24 plane crash in Syria is “a stab in Russia’s back delivered by accomplices of terrorists”. “Today’s loss is linked with a stab in our back delivered by terrorism accomplices. 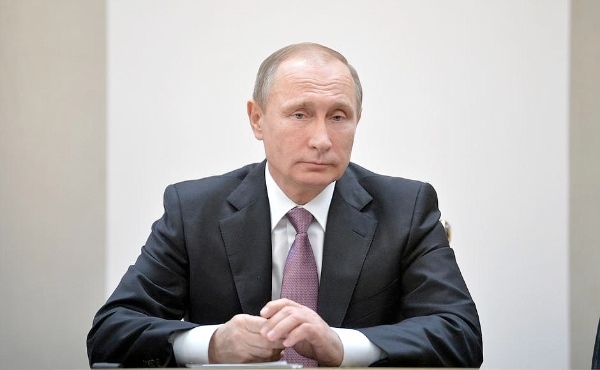 I can’t characterize otherwise what has happened today,” Putin said in Jordan. “The Russian bomber was shot down over Syria by an air-to-air surface fired from a Turkish F-16 plane when the bomber was at an altitude of 6,000 meters at a distance of 1 km from the Turkish bomber.” Putin said at a meeting with King Abdallah II of Jordan. “Our pilots and jet posed no threat to the Turkish Republic. This is obvious. They were conducting an operation against ISIL,” a visibly agitated Putin stressed. Russia has for a long time been aware of oil going from Syrian regions under the control of terrorists to Turkey, Putin said. Turkey said it shot the jet down on Tuesday after repeated warnings over air space violations. Russia said its warplane never left Syrian airspace. The Russian leader vowed Moscow will not tolerate crimes like these warning that “today’s incident will have serious consequences for Russia-Turkish ties”. The Turkish military attache in Moscow has been summoned by the Russian Defense Ministry over the incident. “I understand each country has its own regional interests, and we have always respected that. But we shall never tolerate crimes like today’s incident,” the President said. “Do we want NATO to serve ISIS interests?” Putin asked. Turkey will brief NATO ambassadors on Tuesday about the events surrounding its shooting down of the Russian jet, a spokeswoman for the military alliance said. European Council President Donald Tusk on Tuesday warned of a ‘dangerous moment’ after Turkey’s actions. Tusk called on all to remain “cool headed and calm”, said an AFP report. Meanwhile, global oil prices rose Tuesday with Brent crude, the global oil benchmark, rose 1.1 per cent to $45.33 a barrel on London’s ICE Futures exchange. The Russians should impose a no fly zone over all of Syria that is not a Russian or Syrian plane, they were the only ones invited by Syria. Russia should back it up with anti-aircraft missiles systems, they should start using Neutron bombs on all terrorists, move Tactical Nuclear missiles into Syria, raise defense conditions to Defcon 3, bomb the Saudi Arabian Oil terminals, arm the PKK with advanced strategic weapons systems. Turkey along with the US are supporting ISIS, therefore the blood is on their hands. Putin will put down his foot and not let Assad fall period. TODAY WHEN WORLD IS THRETEN BY OTTOMAN ISLAMIST TERORISM EVER SINNCE 1970’S,IT WOULD BE A SMART MOVE FOR EVERY NATION.THAT HAS BEEN TERORISED BY USA’S SANCTIONS,NATO WARFARE,AND ISLAMIST JIHADISTS,TO JOIN THEIRS ARMYS WITH RUSSIAN AND CHINESE,IN NATIONAL LIBERATIONAL WAR AGAINST ISIS….PS..IN CASE THAT YOU DID NOT NOTICE,A HISTORY OF 1940-1945 IS REPEATING ALL OVER AGAIN,EXPECIALY WAR AGAINST YUGOSLAVIA IN 1941 AND 1991.THE METHODS ARE THE SAME,BUT THIS TIME PRAY IS TERITORY OF AFRICA,MIDDLE EAST AND THEYS NATURAL WEALTH….HERE REFERENCES…MOVIES AGORA AND KINGDOM OF HEAVEN,..YOUTUBE VIDEOS1.TO KILL A NATION Michael Parenti.2.THE WEIGHT OF CHAINS.3.DECLINE OF DOLLAR AND FALL OF USA….WORLD IN 21-ST CENTURY CAN BE SAVED BY INTERNATIONAL SOCIALISM BROTHERHOOD,AND ECOLOGICAL PROJECTS. Putin exposes NATO’s hypocrisy in this “War on Terror”. This ‘false flag’ war already boring. Russia is a only nation that truly combats on the civilization side, against barbarians. Go to the victory Russia! I support the above two comments. I support President Putin as fearless great leader unlike the gangster Presidents of USA and their evil allies. Turkey is quite obviously supporting ISIS. They want Islamic globalism. with enforced sharia law. The one million plus refugees who are Muslims is part of the plan of Islamic globalism. Saudi Arabia will fund the building of more Mosques now in all the EU countries to serve this extra Muslim influx of refugees. Rabid Imams will preach their hate doctrine against these Christian countries and call for jihad and mass slaughter of EU citizens, till they accept rabid Islam of ISIS. Our only hope against this plan of ISIS and Saudi Arabia is president Putin. I agree with the comment of Jerome for Putin and Assad to declare ‘No Fly Zone’ over Syria and for Russia to back it up with their air to air missiles and their fighter aircraft to shoot down all other enemy air craft, including US, British, French, Turkish etc. Also arm the Kurds powerfully against Turkey to create their own Kurdistan.